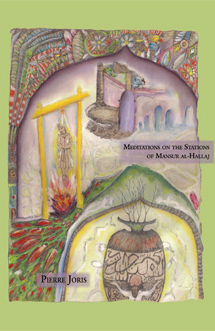 In Meditations on the Stations of Mansur al-Hallaj, out this year from Chax Press, Pierre Joris offers his own meditations on the mediations facing his text. In a note occurring after the ninety pages and forty meditations, we’re let in on the procedure. These are translations of Mansur al-Hallaj, a “tenth century revolution poet, sufi teacher & thinker [who was] executed (after much torture) in a Baghdad jail” (91). These are also translations of translations of translations. al Hallaj’s crime, we’re told, was “to have said ‘ana al-haqqq’ or ‘I am the truth’—an expression that traditionally names one of the attributes of god” (91). Although in complicating al Hallaj’s claims to the Godhead’s singular linguistic authority, Joris finds his (and by extension our) access to the poet profoundly fractured. These forty meditations are concepts taken from al Hallaj’s teachings, but he didn’t write/schematize them himself. This task was completed by an anonymous reader Joris first encountered via an internet search, only later verifying their origins in al-Hallaj’s “40 stations of Moses” (via a Stephane Ruspoli translation). And things fracture even further from here. As Joris notes, Ruspoli’s translation proposes forty-three stations, while his original Arab text steps at forty-one. How Joris’ internet source came to forty, then, seems perhaps only the appeal of a widely divisible number. Yet as he reflects in conclusion, “such discrepancies are to be expected, & it is probably in the fissures between miscounts, recounts, etymologies, misreadings, neologisms, etc. that much of the poetic force of language resides” (92). In this extended meditation on linguistic mediation, Joris finds a powerful way of reflecting on origins and their transformation into our contemporary environment, here that of the US war in Iraq. I started this sequence of poems shortly after the US invaded Iraq, somehow wanting to ward off, hold at bay the utter destruction of the people and the city of Baghdad, one of the greatest cities in the history of humanity . . . but felt that the last one, wonderfully called “beginning, bedaya,” would have to be held back until the last US troops had left Iraq. Within this frame, we’re presented with the profound disjunction between Baghdad’s past and its present, and also a powerful opposition to the United States’ Imperialist justification of the entire war. This argument happens also as the poems/translations play with the fact, bringing it into the bounds of their mediat(ing)(ed) language. In meditation four, “serach,” the typo not only remains in title, but reverberates throughout the poem. resignation no better than search. These lines, the turn to Spanish and “sera,” clearly would not have occurred were it not for the typo, and they seem to inform that poem’s surprisingly optimistic ending, which turns to the power of a curious “I”/eye. I cannot help but read this is “impotence is [only] the/annihilation/of the faculty/of search. This breaking of sincerity into its multitude of linguistic possibilities matches the troubling of mathematics; they both depict the problem of dealing with what’s present versus an ideal method. It is also what Joris pursues throughout his entire volume. Writing about a present war with an eye towards both the past and future. I dedicate this work to my son, Miles, who turned eleven the year the Iraq war started, a war that is thus the first one he consciously experienced in his life. I cannot even say “may it be the only one,” as several wars have broken out since & are raging on. May he & his generation be spared the worst of these totally unnecessary lethal inhuman insanities. Without ever forgetting the bounds of his book, the trouble of poetry’s now very limited reach, Joris in this volume enacts a way of thinking which, applied, might help to achieve this wish.